thanks to the work of George Stephenson, Isambard Kingdom Brunel and Thomas Telford, who brought us techniques which are still in use today, even if the technologies on which they relied have long been superseded. But the UK also played a major role in the foundation of the discipline of electrical engineering, once Michael Faraday had demonstrated how electrical energy could be converted into mechanical energy using electromagnets in 1821. Just over 50 years later came the invention of the electric motor, when Michael Faraday demonstrated how electrical energy could be converted into mechanical energy by means of electromagnets. The need to maintain the new types of specialised machines used in many industrial applications, such as spinning, weaving and heavy manufacturing, was the catalyst behind the development of the concept of mechanical engineering. Any history of the engineering in its broadest sense can only scratch the surface of developments, so for the rest of this article we’ll present a timeline of major events from the last 200 years. From it, you’ll see that the roots of many of the inventions and devices which we take for granted today go back much further than you realise. 1822 – Charles Babbage presents his ‘Difference Engine’ – the forerunner of the modern calculator. By helping greatly improve the accuracy of calculations used to produce arithmetical tables, he lays the ground for massive advances in many fields of engineering and technology over the following century. 1825 – George Stephenson’s Locomotion railway engine is the first to haul passengers, on the 25-mile route between Stockton and Darlington on Teesside in north-east England. Four years later, a competition to design a locomotive to operate the first intended ‘inter-city’ railway service is won by Robert Stephenson, with his Rocket. The service, between Liverpool and Manchester, begins operating the following year. 1839 – Welsh judge and scientist William Robert Grove produces the first fuel cell, by which electrical power was produced through a chemical reaction. In his case, he combines hydrogen and oxygen, but the principle has been greatly refined over the years, and is now used in many modern vehicles. 1840 – Joseph Whitworth’s measuring machine enables the accuracy of any measurements to be massively increased – from one-sixteenth of an inch which had been considered the state of the art to this point, it enables the measurement of objects of as little as one-two millionth of an inch. 1843 – The first fax machine is developed by Alexander Bain, who registers a patent for “improvements in producing and regulating electric currents and improvements in timepieces, and in electric printing, and signal telegraphs”. 1851 – The Great Exhibition, at Crystal Palace, south London, is staged to showcase the cutting-edge inventions of the day. Thousands flocked to see the displays, which covered a massive variety of British-designed products. 1856 – Henry Bessemer lays the foundations for the large-scale replacement of iron with steel with the introduction of his Bessemer convertor, considered to offer the first cheap means of mass producing steel from molten pig iron. Steel production is further advanced the following year, when William Kelly invented the blast furnace. 1858 – Isambard Kingdom Brunel launches his steamship the SS Great Eastern, which at 22,500 tons and 700 feet long, would remain the longest and heaviest sea-going craft for another four decades. 1862 – Birmingham-born Alexander Parkes develops a hard, transparent and flexible material which he calls Parkesine – it is the world’s first plastic. 1868 – After almost 2,500 deaths and injuries on the roads of London a couple of years earlier, the world’s first traffic lights are installed at a junction in Westminster, London, the device having been invented by John Peake Knight. 1876 – Scottish-born Alexander Graham Bell invents the telephone, by which speech is transmitted along wires using electric power. His invention grew out of a fascination with ways of transmitting speech to the deaf. Five years later, he experiences a rare failure, when his claimed metal-detecting device fails to spot the bullet with which US President James Garfield was shot in his bed. 1884 – The modern steam turbine, enabling steam to be converted directly into electricity, is invented by Sir Charles Parsons, who is later called “one of the greatest engineers that this country [the UK] has ever produced”. 1891-93 – Rookes Crompton develops and begins manufacture of a range of forerunners to modern kitchen appliances, including the toaster and electric oven. 1893 – Lancashire man James Sumner invents the world’s first motorised lawnmower. Powered by steam, it weighs two tons. 1907 – Brooklands, near Weybridge, Surrey becomes the site of the first purpose-built off-road racetrack in the world. 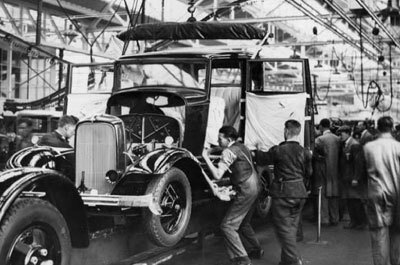 1913 – The world’s first moving production line is installed at the Ford factory in Michigan – paving the way for many thousands more during the century in the UK and worldwide. 1915 – British engineers developed the first battle tank, combining the availability of the internal combustion engine, armour plate and the continuous track to transform warfare. 1917 – The world’s first aircraft carrier, HMS Argus, is launched by the British Navy. 1924 – King George V officially opens Wembley Stadium. Built in under a year at a cost of £750,000, 25,000 tons of concrete, reinforced with 600 tons of steel rods, went into the construction of the stands and terraces. 1924 – John Logie Baird patents a system of mechanical rotating discs which later form the basis for his invention of television. 1929 – Frank Whittle invents the jet engine – despite initially failing to persuade the Air Ministry of the merits of the use of a gas turbine as a means of power for producing jet thrust. 1935 – Reginald Mitchell’s fighter plane, the Supermarine Spitfire, undertakes its maiden flight, three years before entering front-line service with the RAF. 1938 – Streamlined A4 class steam locomotive Mallard achieves a world speed record of 126mph – which still stands as the highest speed achieved by a steam loco. 1941 – The Gloster G28/39 is the first jet-propelled plane to use the engine technology developed by Sir Frank Whittle. 1944 – PLUTO – The Pipeline Under The Ocean – is completed, to supply petrol from southern England to Allied forces advancing through France after their victory of 6 June (D-Day). 1945 – Alan Turing develops his Bombe machine, an electro-mechanical device used to crack the coded messages sent by German forces. 1957 – The first commercially-operated nuclear power station in the UK opens, at Calder Hall, Cumbria. The site is now part of the Sellafield complex. 1959 – Sir Christopher Cockerell’s first hovercraft, SRN-1, makes its maiden voyage. 1967 – Barclays Bank installs the first, early version of an ATM at a branch in north London. 1969 – Concorde undertakes its maiden flight. It entered passenger service in 1976, and was withdrawn in 2003. 1973 – Dr Martin Cooper, working in conjunction with manufacturer Motorola, invents the first mobile phone. It weighs two kilos (4.4lbs). 1984 – Charles W Hull patents the term ‘stereolithography’, the process of reproducing three-dimensional images, and the founding principle for the 3-D printer. 1984 – Apple introduces the world’s first commercially successful computer to use a mouse and a graphical interface. 1989-90 – Sir Tim Berners-Lee invents a system for interlinking text documents via a web browser, and so the worldwide web is born. 1990 – Computer engineer Alan Emtage builds the first search engine. 1991 – The first wind farm in the UK opens, at Delabole in Cornwall. 1993 – James Dyson’s bagless vacuum cleaners enter large-scale production. 1994 – The Channel Tunnel opens, providing the first physical link between the Britain and mainland Europe. 1997 – IBM super-computer Deep Blue beats world chess champion Garry Kasparov, an event which was hailed at the time as a triumph for artificial intelligence – and today, much more sophisticated machines regularly beat human competition in other games of mental agility. 2000 – The UK’s first offshore wind farm opens, off the Northumberland coast. 2001 – The world’s first mass-produced petrol-electric hybrid car, the Toyota Prius, goes on sale in the UK and worldwide. 2002 – The Falkirk Wheel, the world’s only rotating boat lift, linking the Forth and Clyde and Union Canals in central Scotland, opens. 2003 – The Renault Kangoo, the world’s first plug-in electric hybrid vehicle, is launched. 2007 – Sun21 makes the first solar-powered crossing of the Atlantic. 2008 – The first commercial carbon capture and storage plant enters operation. 2010 – Two scientists win the Nobel Prize for Physics for their work in isolating Graphene, a crystalline form of carbon and one of the strongest, lightest substances known to man. 2012 – The first electric vehicle charging stations appear in the UK. 2013 – BAE Systems launches its first ‘super sub’, HMS Ambush, which can ‘hear’ a ship before it has left port on the other side of the Atlantic. Engineering experts are constantly seeking out new and exciting developments in the UK, but today’s industry is more global than ever. All the developments above were made or advanced in some form by talented engineers working here. Who knows what developments they, and new entrants to the profession, will be responsible for in the next two centuries? Exciting opportunities abound in many different types of engineering disciplines for people with enquiring minds who want to build the society of the future. Get in touch and register with Perpetual Partnerships if you want to find out more about some of these openings in and around Cheshire.